Jerin has changed millions of lives through keynote speeches, viral interviews, trainings and movement-building. She speaks regularly to local, national and international audiences on a wide range of topics, below. In this viral video with over 1,000,000 views, Jerin gives tips on how to create a more inclusive, equitable and just society starting right now. She explains how to be more intersectional "simply and clearly." Intersectional Feminism: Intersectionality; Convening Unlikely Allies / Coalition-Building; Engaging Men. Muslim Feminist: LGBTQAI+ Muslims rights; Feminists of Faith and Reproductive Rights; Interfaith Dialogue and Collaboration. Young Feminists: Lifting Up Leadership of Young Feminists; Leadership Training; Confidence / Love Your Body Day; Career Coaching. Violence Against Women / Gender-Based Violence: Campus Sexual Assault / Title IX; Anti-Sexual Harassment Training; Bystander Intervention; Domestic Violence; Street Harassment. Grassroots Organizing and Systemic Change: Feminist Force Field; Online/Offline Advocacy. "Jerin Arifa has made me confident and has empowered me to own my space. She guided me on how to become a activist from ground up. ... I am beyond grateful to have Jerin in my life because without her, I wouldn’t have the self-confidence that I have today. She has been my mentor and has exceptional skills to end gender discrimination and sexual harassment. ... with grace, passion, and strength." Founder and President, Michigan Skyline High School NOW Club. TEDx Speaker, Adjunct Instructor and Founder, Feminist Self-Defense. “We are so thankful to have had Jerin as our keynote speaker. … She left the audience inspired and with ideas on how they could drive change in their own communities, no matter their background or experience. … Jerin has empowered us with her story, and our conference would have been incomplete without her impactful voice." Harvard Alumna, Jewish Week's 36 Under 36 and Director of Academic Affairs at the Consulate General of Israel to New England. "I am so thankful that I had the opportunity to meet with Jerin, learn through her, and become a friend. The work she does always leaves me inspired after we talk." Project Head, Open Society Foundations. "Jerin is an inspiring mentor who imparts invaluable wisdoms about how to turn a vision into a reality. Her positive outlook, determination, and commitment to community have allowed her to make record strides on issues pertaining to women's empowerment. ... Jerin's commitment to guiding the next generation of feminists reflects her talent for training and facilitation." 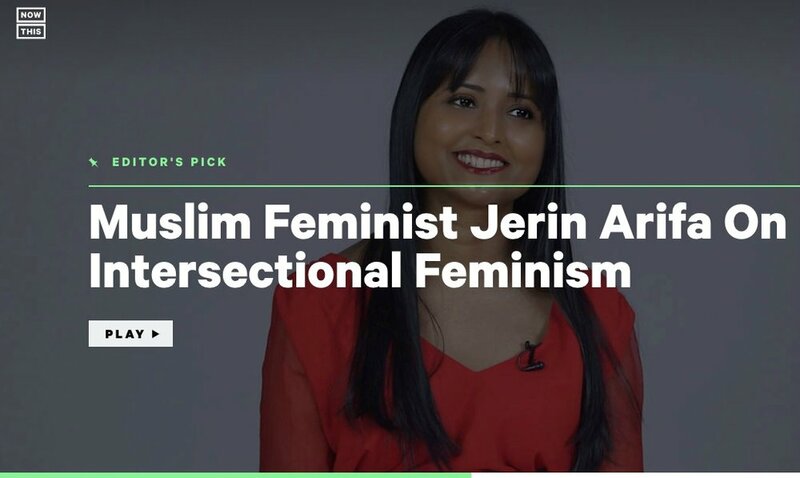 "I am only 14-year-old writer for Ms., but I have been a fan of Jerin Arifa for a while--a Brown, Muslim activist discussing intersectionality--it's a rare feeling these days for young Brown Muslims to see themselves in such a positive light." "It was inspiring to hear Jerin’s journey working across campuses and with feminist organizations to influence a large higher education institution." Women’s Center for Gender Justice at John Jay College. "I have seen Jerin's organizing capabilities first-hand. She single-handedly created the first totally on-line chapter for the National Organization for Women (NOW)." "Jerin embodies the strength and courage of intersectional social justice for all--and she does it through powerful compassion." Writer, Performer, Activist and Award-Winning Playwright. "Jerin practices the feminism she preaches, which is an intersectional, caring effort to improve women’s lives." "Jerin fiercely defends and honors the strength of women, effective and collaborative leadership, and equality for all people. She is a true leader." Certified Yoga Teacher and Women's Rights Activist.